Former Galaxy and Heart presenter Paul Hayes is to take over the afternoon slot on Radio Aire in Leeds. 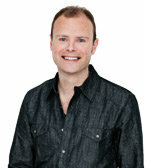 Hayes has spent the last three years on Montreal's CKBE FM 92.5 The Beat. Before that he has worked at Galaxy Yorkshire, TFM, Southern FM and Neptune Radio before hosting the evening show on Heart London. He made an emotional farewell on his last show in Canada on Sunday - you can listen to his send-off below. Hayes will start his new show - which will go out from 10am to 3pm, Monday to Friday - on July 15.